Endo announced that the Food and Drug Administration (FDA) has approved Belbuca (buprenorphine) buccal film for use in patients with chronic pain severe enough to require daily, around-the-clock, long-term opioid treatment and for which alternative treatment options are inadequate. Belbuca is the first buprenorphine formulation developed as a dissolving film absorbed through the inner lining of the cheek for chronic pain management. It is a mu-opioid receptor partial agonist and strong analgesic with a long duration of action. Belbuca uses BDSI’s patented BioErodible MucoAdhesive (BEMA) technology that delivers buprenorphine across the buccal mucosa efficiently. The FDA’s approval was based on two double-blind, randomized, placebo-controlled, enriched-enrollment Phase 3 studies in patients with moderate to severe chronic low back pain (n=1,559). In the trials, patients were titrated to a tolerated, effective dose of Belbuca during an open-label period and then randomized to either continue on Belbuca or receive a placebo buccal film. Treatment with Belbuca showed a consistent, statistically significant improvement in patient-reported pain relief at every week from baseline to Week 12 vs. placebo for both studies. 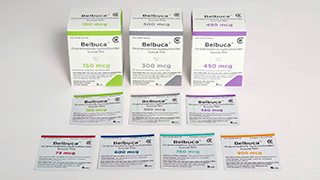 Belbuca, a Schedule III substance, will be available as 75mcg, 150mcg, 300mcg, 450mcg, 600mcg, 750mcg, and 900mcg strengths in 60-count cartons. It is anticipated to launch in the first quarter of 2016. For more information call (800) 462-3636 or visit Belbuca.com.